Developer is Matthew Reis, who’s also behind the noise project Teeth Collection. 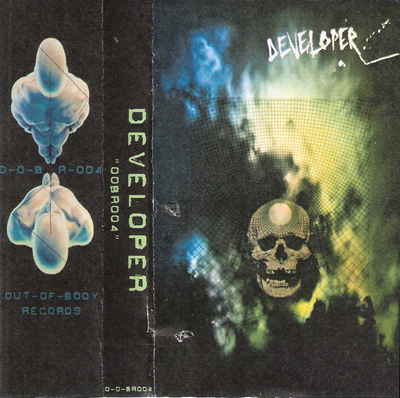 As you can see, Developer’s not really into naming his works (most of his other releases are simply the tape number), but his harsh noise on OOBR004 is significantly more complex than this. The sources of the sounds alternate immensely, and often found sounds and samples make their way into the mix during the quieter times before calamity strikes. The harsh noise on this cassette is often cut-up, with a nice rough sound that often jumps from different textures quickly. It’s all very fast-paced and chaotic, but with these jumps often comes certain ambient touches that add field recordings, whether it be water running or the gritty pounding of drums. There are also portions of silence, stop-starts that add an interesting element to Developer’s work. Some of the harsh noise sounds similar to what other cut-up artists have been doing, but Developer often allows certain samples to loop for a little while before continuing on. The most important part of OOBR004 is that it knows what samples are worth looping. When Developer falls into these bits of stasis, they’re rhythmic sections that are nicely nuanced, with a little variety within them. They’re not quite drones, and that means that along with the harsh spits and sputters of the feedback and static, there’s also just a little bit of staccato and melody that is quite pleasing. It’s an interesting project, one that will often change from release to release depending on the sound samples and the context that Developer would like to create.